The average diet in the Victorian era was rich and fatty. As a result, indigestion was a common problem. Many remedies were available: ginger extracts taken in water; carbonate of soda taken an hour before eating; even arsenic was recommended for severe cases. 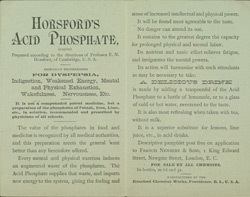 Professor Horsford's phosphate would have neutralised acid in the stomach. As with many non-prescription remedies in the Victorian era, it is here advertised as a cure-all: treating everything from dyspepsia to mental and physical exhaustion.